Every day it seems there are more breaches and hacks, some big, some small. Dashlane already alerts all of its users to publicly known breaches. 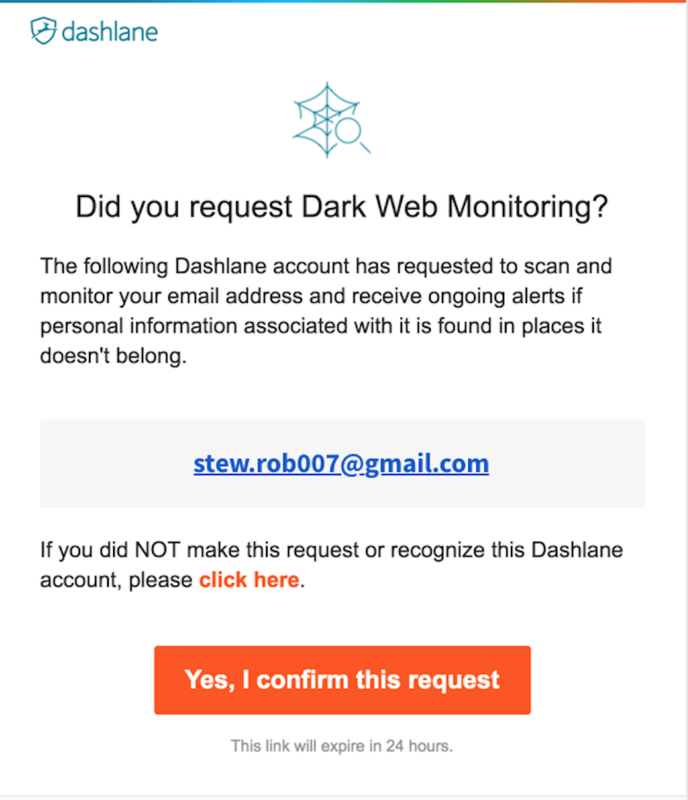 But Dark Web Monitoring, available with Dashlane Premium, is a tool designed to constantly scan the web for your compromised personal information, and to allow you to take action to secure your accounts after a breach. As its name suggests, Dark Web Monitoring scans the web for any leaked personal data and sends you alerts, so you can take immediate action to protect your accounts. You're able to monitor up to 5 email addresses. 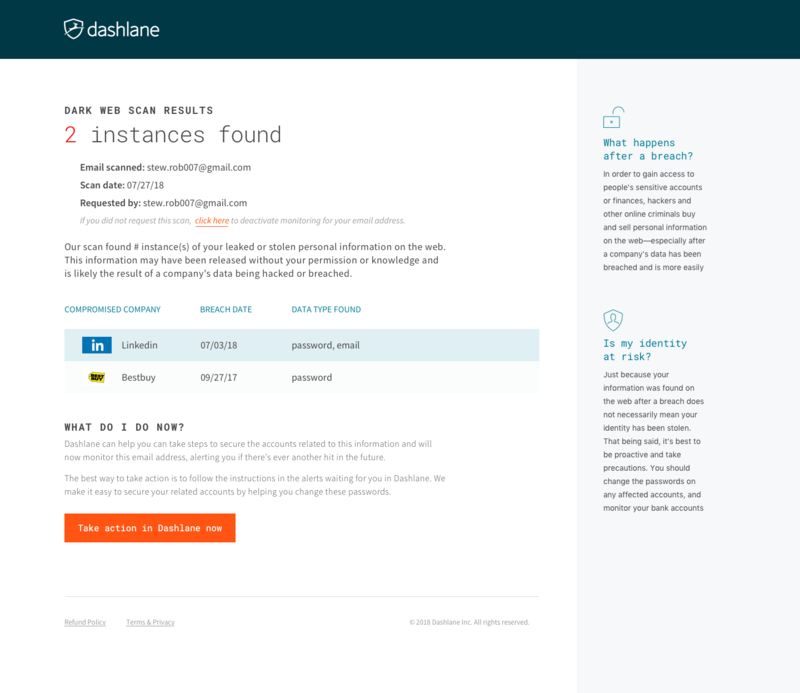 For each email address, Dashlane runs an initial scan that turns up all currently findable instances of personal information related to that address. The kinds of personal information typically identified include usernames and passwords, credit card numbers, Social Security numbers, phone numbers, and postal and IP addresses. 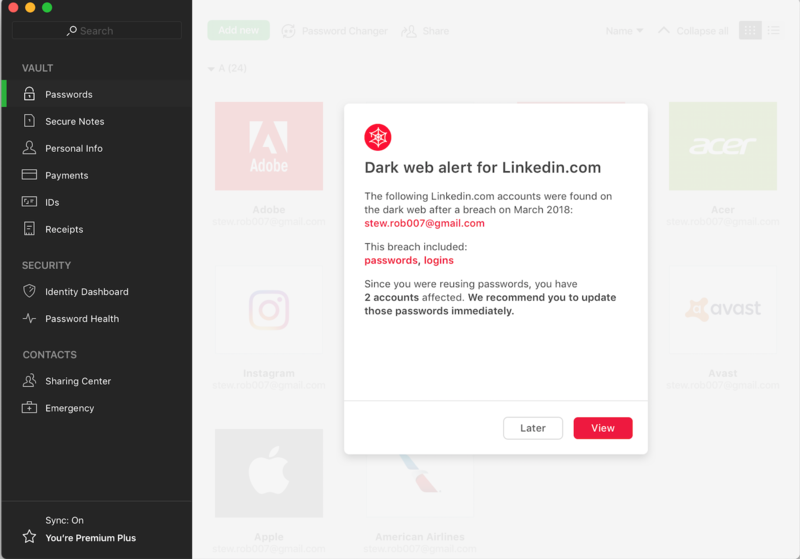 After the initial scan, whenever anything is turned up, the results of subsequent scans are communicated to you via email, via popups within Dashlane, and finally through Dark Web Alerts on your Identity Dashboard. These alerts will prompt you to change your affected passwords, which are also then listed as compromised passwords in the Password Health section of your application. Note that Dark Web Monitoring is currently not available on the web app. You may also wish to consult Dark Web Monitoring – Frequently Asked Questions, or What are security alerts and Dark Web Alerts, and what to do when I get one. 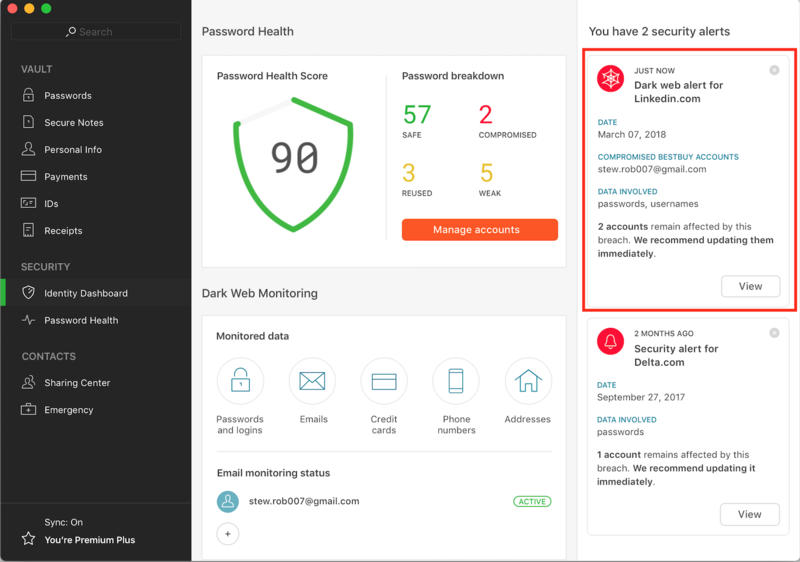 On your Identity Dashboard, locate the Dark Web Monitoring module (see here for more information about the Identity Dashboard). Before it is set up, you are prompted to enter in an email address you would like to use for a scan. Enter one of your addresses you would like to scan, and click Start monitoring. Once you have entered the email address you wish to use for the scan and clicked Next, Dashlane will send a verification email to that address. You may close this popup once you've seen it. Your next step is to log in and click on the link within that email, once you have verified that it is indeed your account, that you made the request, and that you wish to confirm the setup. Note that for security reasons this link is valid for only 24 hours. As always, if you should have but did not receive the email, please check your spam folder. When you click on Yes, I confirm this request, you will be taken to a web page with your Dark Web Scan results. If you are fortunate enough for your scan to have found zero hits on your data, this is great news! The page will propose that you perform the scan using other email addresses. Otherwise, you will be shown a page like the one below, indicating the number and kinds of your data that were found by the scan, and especially to which accounts they were linked. You are encouraged to change the passwords of your compromised accounts by clicking on Take action in Dashlane now. 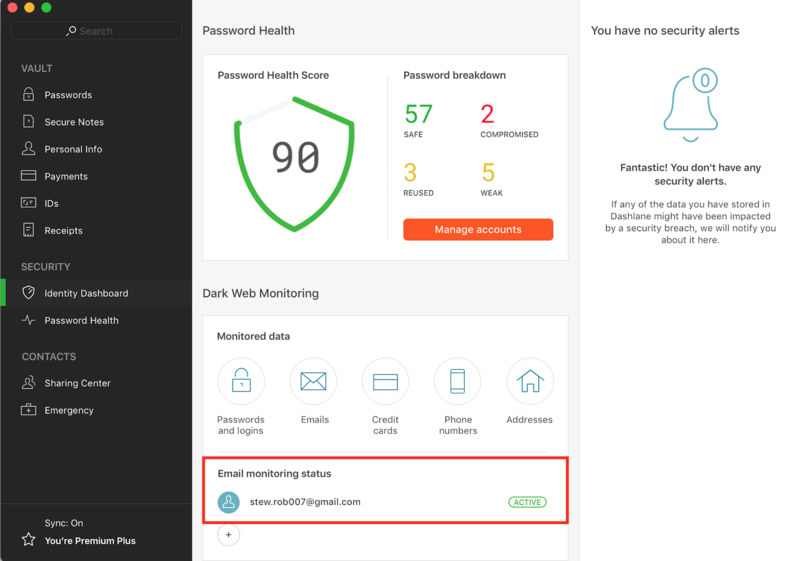 Once Dark Web Monitoring is set up, you can always find the email addresses for which the monitoring is active by checking in your Identity Dashboard. Remember, to activate an email address you must verify the account through the email we send you. Before this has been completed, the email address will be marked "pending". Once an address is active, your Dark Web Monitoring will constantly search for your compromised data, and will send you both an email and an in-app alert like the one below whenever it finds any. And finally, you’re alerted in the Security alerts module of your Identity Dashboard. A new alert will remain in your Identity Dashboard until you change those compromised passwords, or else choose to simply dismiss the alert by clicking on the small X in the upper right-hand corner of the alert. For more information about what to do when you receive a Dark Web Alert, see here.